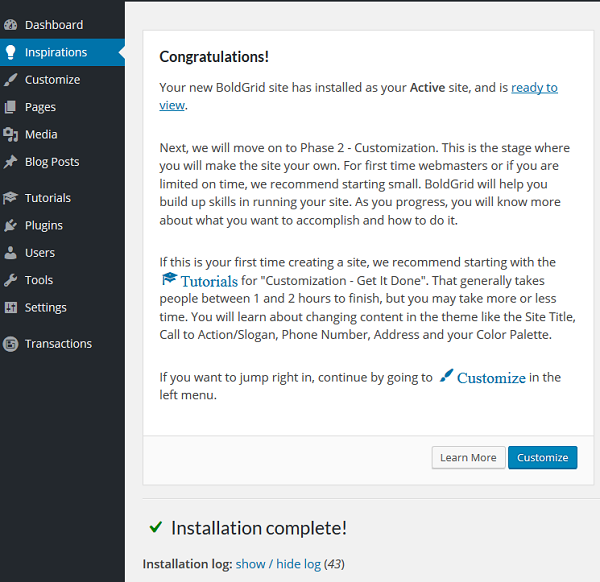 Today, we will be reviewing BoldGrid, a revolutionary new website builder that is built on top of WordPress. What exactly is BoldGrid? It’s a solution to the problem of how to create a website without coding knowledge and without using a dedicated website builder. 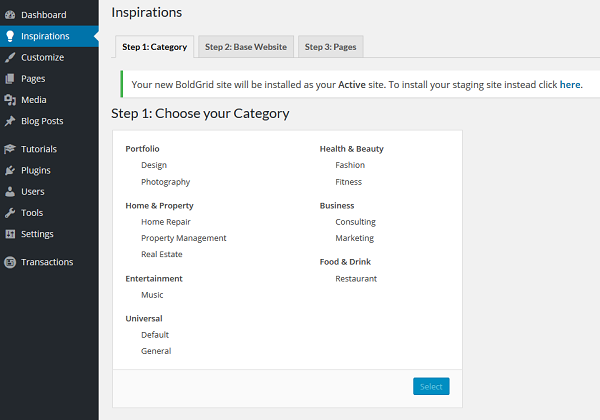 In fact, BoldGrid is built on top of WordPress, and as such allows you to benefit from thousands of themes and plugins that have been developed in WordPress. In addition, this eliminates the monthly fees you are would normally be required to pay if you were using a website builder. There are 2 stages of website creation with BoldGrid. The first stage is the “inspiration” stage, where you choose the type of theme you want. The second stage is the “customization” stage, where you actually change all the elements in the theme and customize it to your liking. So let us walk through all the steps to see just how easily and quickly you can make a website with BoldGrid. I chose the “Design” category for the purposes of this review. Next, after choosing the category you are presented with all of the themes available inside that category. 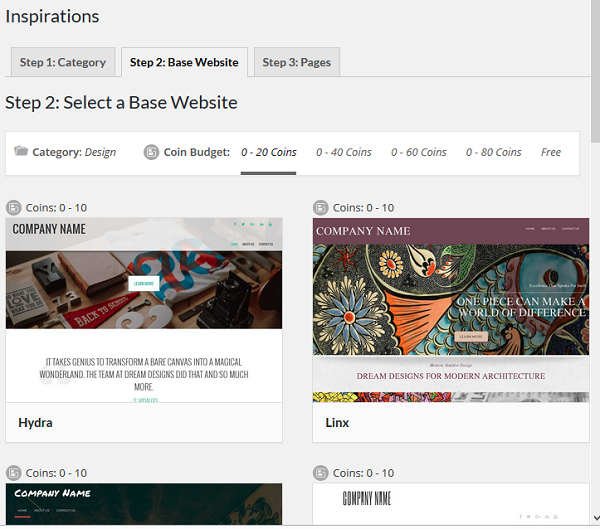 I picked a theme that I liked and was then taken to the “Pages” section, where you need to pick how many pages your website will have. 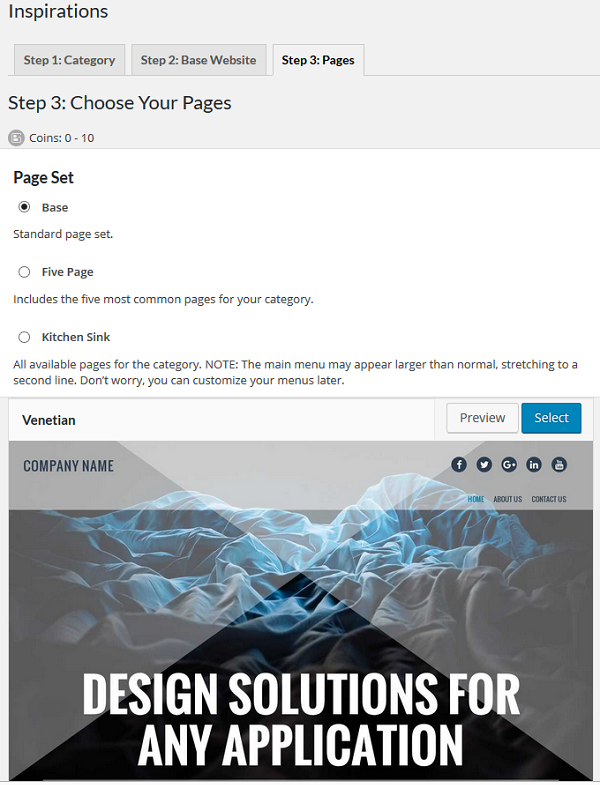 The 3 options here are “Base”, which includes the standard pages in the theme, “Five Page”, which gives you 5 most commonly used pages in the category you’re in, and “Kitchen Sink”, which gives you all the possible pages you can have inside a given category. There is a warning given here that choosing “Kitchen Sink” may make your menu unusually long. You may have noticed something about “Coins” in the above screenshot – there will be more on that later in this review. And that was it for the Inspiration stage. You will get on-screen confirmation that you are finished with the Inspiration phase and you are about to enter the Customization phase. After I clicked “Customize” I was taken to a theme Theme appearance section, which looks and acts exactly the same as any WordPress theme appearance customization section. Here you can choose your site title, logo, colors, background, menus, header and footer widgets, as well as advanced customization options including custom JS and CSS. The cool thing about BoldGrid is that it allows you to create and work on an entirely new version of your site, all while keeping your current site active. This is accomplished through BoldGrid’s “staging” functionality, where you can build out and view your new (staging) site, and make it live only after you are fully comfortable with how the new site looks and functions. It should be noted that at this time BoldGrid works from BoldGrid-supported hosting providers only. Currently, your 2 hosting choices when it comes to BoldGrid are InMotion Hosting and Web Hosting Hub. Once you have a BoldGrid-supported hosting provider, you can use BoldGrid by picking one of the account options (outlined below). You can also add some functionality by having “coins”. This is really like credits which you use to “purchase” additional things inside your BoldGrid-enabled WP admin panel. Free Version. In April of 2016, there will be a free version of BoldGrid that allows you to use all of the functionality of BoldGrid but excludes support. Hosting and installation will also be your own responsibility when choosing the free option. Web Professional Version. This will be available in June of 2016. There isn’t much information available on this version at this time. Premium Version. This version will also be available in June of 2016 and will include things like automatic updates of all BoldGrid themes and plugins, GridBlocks, installation support, and 24/7 chat and ticket support. Ready to dive in deeper? See this page on how to get started with BoldGrid today.